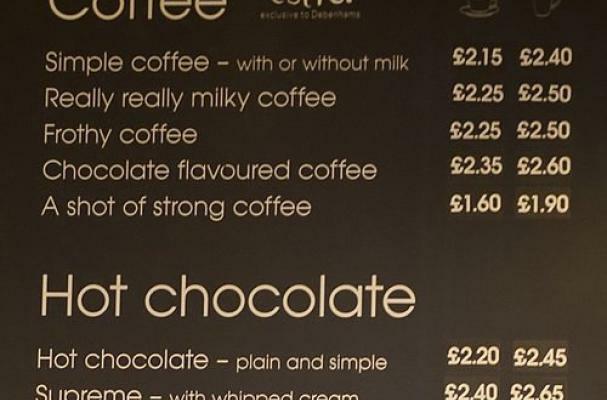 Debenhams Department stores in the UK Have managed to simplify their cafe menus to save those from confusing coffee jargon. Instead of lattes and mochas, the store's trial menu offers "really really milky coffee" and "chocolate flavored coffee". John Baker, who is the Director of Food Services for the department store chain says, "We're trialling a redesign of our coffee menu in Oxford Street so shoppers spend less time playing coffee Cluedo and more time enjoying their favourite drink." But if you're still confused about what makes a really really milky coffee, check out this venn diagram of coffee drinks. Do Debenhams honestly think anyone will feel any more comfortable asking for 'a chocolate flavour coffee, please' than they were uncomfortable asking for a Mocha?